This book offers a fresh and comparative approach in questioning what education is being used for and what the effects of the politicisation of education are on Asian societies in the era of globalisation. Education has been used as a political tool throughout the ages and across the whole world to define national identity and underlie the political rationale of regimes. In the contemporary, globalising world there are particularly interesting examples of this throughout Asia, ranging from the new definition of Indian national identity as a Hindu identity (to contrast with Pakistan's Islamic identity), to particular versions of nationalism in China, Japan, Singapore and Vietnam. In Asia education systems have their origins in processes of state formation aimed either at bolstering 'self-strengthening' resistance to the encroachments of Western and/or Asian imperialism, or at furthering projects of post-colonial nation-building. State elites have sought to popularise powerful visions of nationhood, to equip these visions with a historical 'back-story', and to endow them with the maximum sentimental charge. 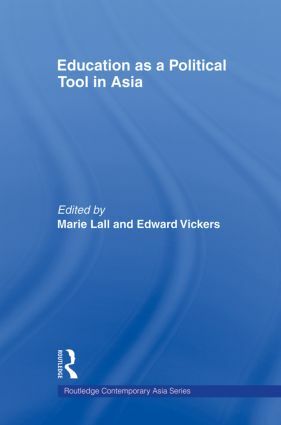 This book explores all of these developments, emphasising that education is seen by nations across Asia, as elsewhere, as more than simply a tool for economic development, and that issues of national identity and the tolerance - or lack of it - of ethnic, cultural or religious diversity can be at least as important as issues of literacy and access. Interdisciplinary and unique in its analysis, this book will be of interest to scholars of political science, research in education and Asian Studies.